March 06, 2011 by Alphageek in "alphageek", "review", "urbanspoon"
This restaurant has several things going for it. The first is that it is a great place to go for something quick to eat. Sushi can sometimes be something that takes a while for the chef to prepare. Sushi can be a ritual, which is fun. Sometimes, it is great to run in, sit right down, and start eating sushi. The second thing going is that it is fun. The reason one can start enjoying sushi so quickly is that the sushi is made ahead of time, and travels around the restaurant on a conveyor belt. We love to sit and watch the colorful dish silently travel by, and speculate about what some of the more exotic ones are. Each color plate has a cost that is posted on the wall. Because of the conveyor belt, this is a great place to take children, as long as they like sushi. They get to be somewhat independent, and pick their own meal out, just like everyone else. I have yet to eat with children at Kappa Garden Sushi Bistro (KGSB) when the children did not have a good time. I took some pictures that were really good. In fact they are some of the best food pictures I have taken. I don't ordinarily group my shots from one restaurant into a set over on flickr, but I did today. Come to think of it, I don't usually post more than three or four pictures from a restaurant, but today I did over ten. You can click here to see the set, if you are interested in sushi pictures. Today, I am going to hit the highlights of what we enjoyed. To the right is something nice and simple. 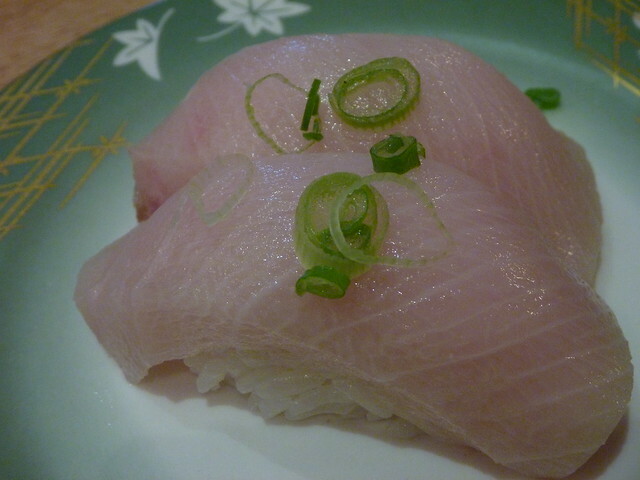 Is is a piece of yellowtail in all of the yellowtail glory. 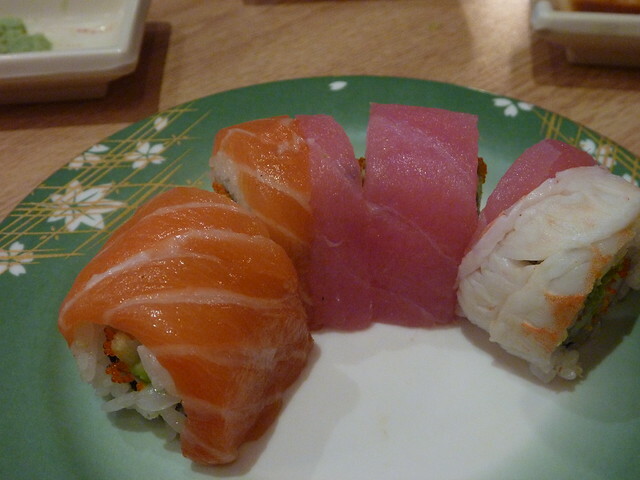 KGSB offers a tempting selection of nigiri sushi. On the day we were there, salmon, tuna and other varieties passed by us in plentiful amounts, and all looked as good as the picture here. We also enjoyed KGSB's play on California rolls. Today, they were offering a California roll (left) that was covered in avocado. 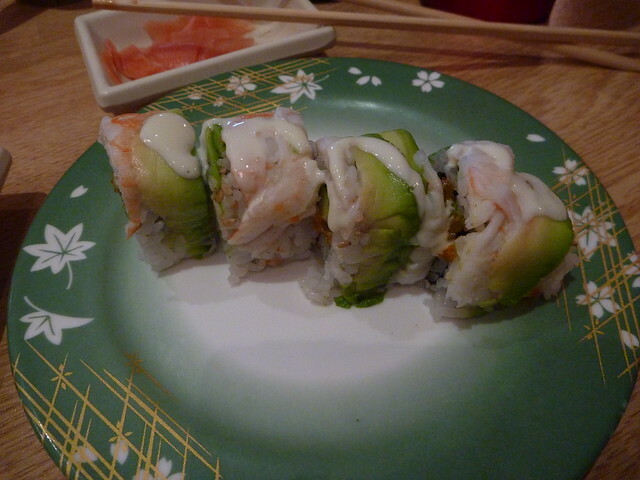 It also has a mild mayonnaise based sauce, that complimented the taste the avocado added to the California roll. On the right is a California roll covered in three kinds of fish. I always enjoy the variety of this kind of roll because I feel like I am getting several different kinds of rolls all at once. I know, it is the little things that make me happy. I close today's stunningly large review with a large picture of a shrimp tempura roll. However, this is not any shrimp tempura roll that I have had before. 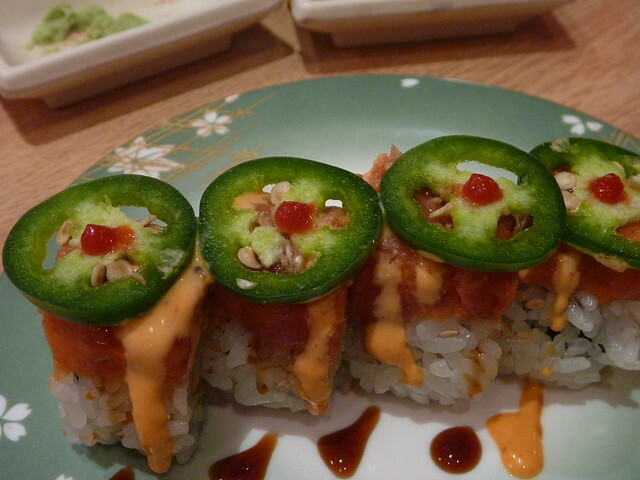 It had some tuna on the outside, topped with jalapeno and a drop of hot sauce. It was simply delicious and something I look forward to again. One small note: on the map below, the restaurant appears to be misplaced. I think it is google's fault. If you don't know where KGSB is, I recommend calling ahead and asking for directions. Use the phone number in the directions below.